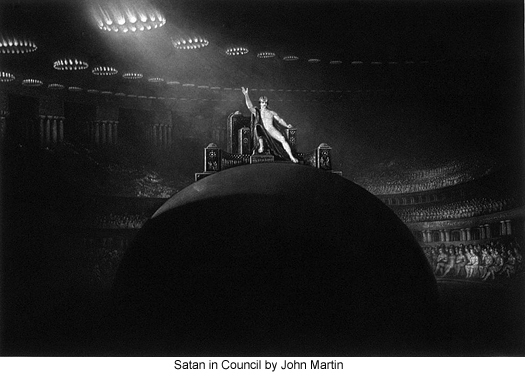 Satan is a personality who is best known on our planet - and justifiably so - as one of the major "forces of darkness." The name of Satan is frequently used interchangably with Lucifer and "the devil." However, they are in actuality three different personalities. One of the revelations of The Urantia Book that holds great value - and great interest for all of us - is the revelation regarding the true and complete story regarding Satan. We learn who he is, what he did to earn him such infamy, and where he is today. Below are some quotes to get you started. Please click on any of the links to expand the quote in context, and please see our studies of Lucifer and The Devil for further information regarding these other "forces of darkness." The Lucifer manifesto was issued at the annual conclave of Satania on the sea of glass, in the presence of the assembled hosts of Jerusem, on the last day of the year, about two hundred thousand years ago, Urantia time. Satan proclaimed that worship could be accorded the universal forces—physical, intellectual, and spiritual—but that allegiance could be acknowledged only to the actual and present ruler, Lucifer, the "friend of men and angels" and the "God of liberty." Satan and the "War in Heaven"
To all the Lucifer-suggested compromises and makeshifts, to all such specious proposals about the incarnation bestowal, Jesus only made reply, "The will of my Father in Paradise be done." And when the trying ordeal was finished, the detached guardian seraphim returned to Jesus' side and ministered to him. In the midst of the discussions of this after meeting, one of the Pharisees from Jerusalem brought to Jesus a distraught youth who was possessed of an unruly and rebellious spirit. Leading this demented lad up to Jesus, he said: "What can you do for such affliction as this? Can you cast out devils?" And when the Master looked upon the youth, he was moved with compassion and, beckoning for the lad to come to him, took him by the hand and said: "You know who I am; come out of him; and I charge one of your loyal fellows to see that you do not return." And immediately the lad was normal and in his right mind. And this is the first case where Jesus really cast an "evil spirit" out of a human being. All of the previous cases were only supposed possession of the devil; but this was a genuine case of demoniac possession, even such as sometimes occurred in those days and right up to the day of Pentecost, when the Master's spirit was poured out upon all flesh, making it forever impossible for these few celestial rebels to take such advantage of certain unstable types of human beings. "Many of you have this day come to the parting of the ways; you have come to a beginning of the making of the inevitable choice between the will of the Father and the self-chosen ways of darkness. And as you now choose, so shall you eventually be. You must either make the tree good and its fruit good, or else will the tree become corrupt and its fruit corrupt. I declare that in my Father's eternal kingdom the tree is known by its fruits. But some of you who are as vipers, how can you, having already chosen evil, bring forth good fruits? After all, out of the abundance of the evil in your hearts your mouths speak." The one hundred System Sovereigns come periodically to the Edentia conclaves which deliberate on the welfare of the constellation. After the Satania rebellion the archrebels of Jerusem were wont to come up to these Edentia councils just as they had on former occasions. And there was found no way to stop this arrogant effrontery until after the bestowal of Michael on Urantia and his subsequent assumption of unlimited sovereignty throughout all Nebadon. Never, since that day, have these instigators of sin been permitted to sit in the Edentia councils of the loyal System Sovereigns.